If you want to watch local Olympian Ryan Hall Race today, the Olympic marathon will be broadcast at 6:30pm (PST). There will be a community viewing party at the Big Bear Convention Center today if you want to join other residents to watch the event. The free celebration will begin at 2pm. There will also be activities for kids, live entertainment. Food and drink will also be available for purchase. All proceeds from this event benefit the Big Bear High School athletics department. 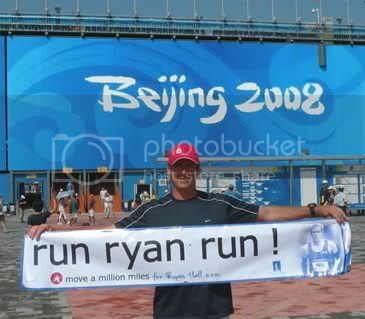 Rick Herrick of KBHR 93.3 radio is currently in Bejing so look for the Run Ryan Run banners. 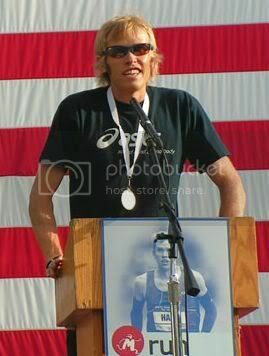 Ryan Hall in Big Bear. Photo courtesy of KBHR. On the West Coast the marathon will be viewable at August 23rd at 6:30pm (PST) on NBC. Beijing is 15 hours ahead of Big Bear time which means Ryan will actually be running at 4:30pm–send your good thoughts then. Randall Putz said that residents with Charter cable can watch the delayed KNBC feed on Channel 4 (104.2 in HD or 784 on Digital Service) but that satellite subscribers can pick up the live East Coast WNBC feed beginning at 4:30pm PST (Channel 241 on Dish or 82 on DirecTV). Above: Big Bear’s Rick Herrick of KBHR in Bejing. Photo courtesy of KBHR. Rick Herrick of KBHR is in Bejing covering the event and you can get further information and few additional photos at the KBHR website or listen to the updates on 93.3 on your FM dial. This entry was posted on Saturday, August 23rd, 2008 and is filed under Mountain Lake Resort.